I'm planning to build a 12V battery-powered led light to use as work light, when taking photos and filming. The power will probably be about 10W. Does it make sense to use 3x li-ion batteries? If I do I will probably need a step up+down to give the leds 12V when batteries are full (12.6V) and when batteries are near empty (9V). 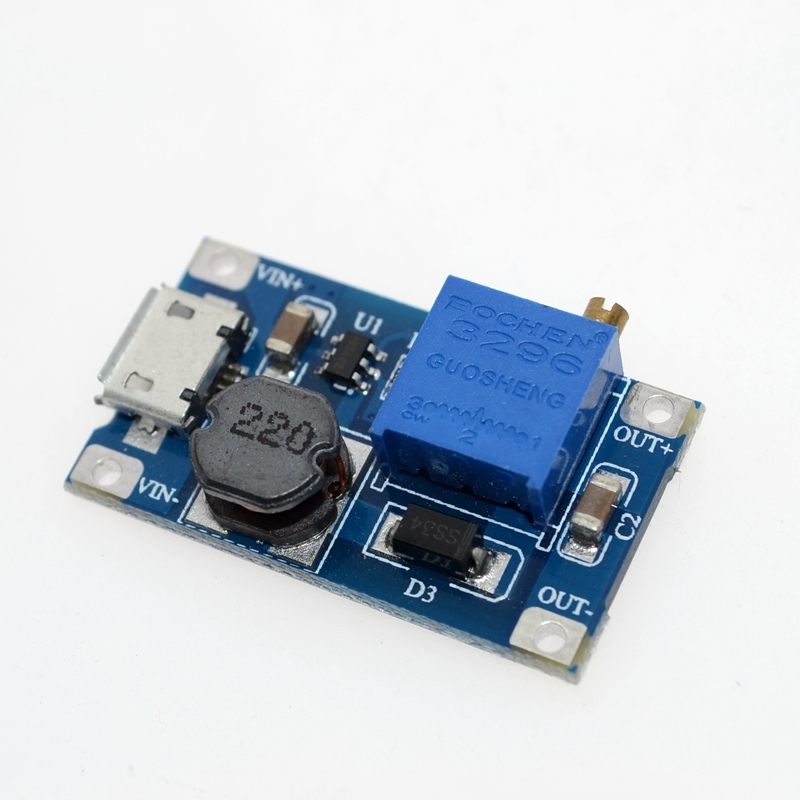 Would MT3608 http://www.aliexpress.com/item/MT3608-DC-DC-Adjustable-Boost-Module-2A-Boost-Plate-2A-Step-Up-Module-with-MICRO-USB/32680855927.html work? I'm not sure how I would charge the batteries though, maybe with 3x TP4056 http://www.ebay.com/itm/5PCS-TP4056-5V-Micro-USB-1A-Lithium-Battery-Charging-Board-Charger-Module-/291648406607?hash=item43e799844f ? how mobile would you like it to be? What about a car battery? it's 12V, so no need for boosters..
or even use a 12V lithium-ion pack directly? @tbowmo that's a good idea. A 12V motorbike battery with 1.2Ah capacity weights 600g which is a bit heavy, but manageable. Example at biltema, 12USD. I would get more capacity and lower weight with 3x 18650 li-ion though. Hello, I would use 18650 too. But only two of them with good capacity so you only use a step-up (I use the one you reference to power a 12V bluetooth speaker from a 5V AC/DC power source with no problem so far). You can carry one or two sets as backup and they will only weight a fraction of the motorbike battery. Chargers charging two 18650 at a time are also easily available, cheap and lightweight. LeadAcid batteries in cars/motorcycles are no good, since they are designed as starter-batteries and can't withstand deepcycle. @bjacobse Good point. Truck batteries sounds heavy though are they? What about using the battery packs used in cordless drills / power tools like the De Walt 18V packs or Ryobi One systems? Find a damaged drill and cut the base off to re use the socet, or just solder direct to the terminals and use a charge module to charge it up. You can buy the batteries separately too. They are lightweight, have a good charge storage and are pretty rugged, so put up with a bit of pounding. It has a buck converter with constant current and constant voltage settings which is what batteries need. It can charge any kind of battery with proper float voltage and current settings. If you would go with 4 lithium cells in series you can use the same module to charge the batteries and use it to drive LEDs. Multiple cell lithium batteries normally also need a balancing circuit. Not absolutely necessary, although recommended.